Skin-care specialists often classify skin types as normal, dry or oily. However, when your skin is both oily and sensitive, it isn't quite that simple. People with sensitive, oily skin often struggle with typical oily skin symptoms such as acne or blackheads, as well as a sensitivity to skin-care products or exposure to environmental conditions, such as sun, wind, heat and cold. 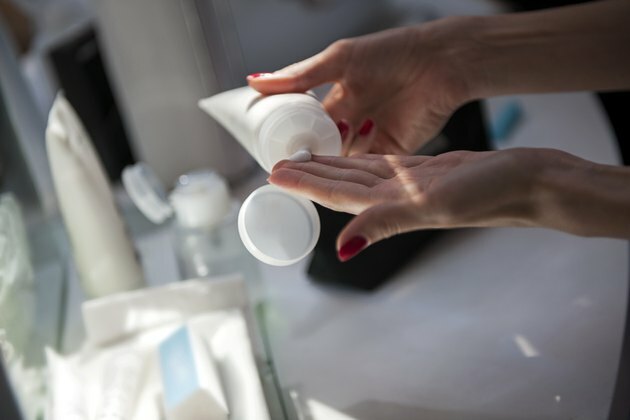 Choosing skin care products that address both issues is a challenge -- but not a lost cause. Cleanse your face every morning and evening, using a gentle liquid or foaming cleanser formulated for sensitive skin. Be sure the product contains no fragrance, alcohol or sodium lauryl sulfate, which are likely to irritate the skin. Massage about a teaspoon of the cleanser gently into your skin with your fingertips, then splash your face with cool water to remove all traces of the cleanser. Pat your face dry with a soft towel or let your skin air dry. Follow each cleansing with a gentle, alcohol-free toner, which helps prevent breakouts by maintaining the proper skin pH. Look for a toner containing mild, natural ingredients such as aloe vera, calendula or witch hazel. Smooth the toner lightly over your dry skin with a cotton ball, then let it air dry. Use cosmetics marked non-comedogenic, which indicates that the ingredients won't clog your pores. Additionally, use alcohol-free cosmetics and other skin-care products to avoid skin irritation. Remove your makeup before bed every night using oil-free makeup remover. Apply a medicated cream or lotion containing salicylic acid or glycolic acid once or twice every week. Use a product with no more than a 2.5-percent concentration of acid because stronger formulations may irritate the skin. Apply the product after washing your face in the evening. Apply a mild, non-comedogenic sunscreen with an SPF factor of at least 30 every time you go outdoors, including during the winter or on overcast days. Sunscreen is critical if you use alpha-hydroxy acid, which makes the skin more prone to sunburn. Perform a patch test on your skin before using any new skin-care product. Place a small amount of the product on your neck before you go to bed, then check for a reaction in the morning. You can use the product as directed the following night if there is no irritation, redness or rash.